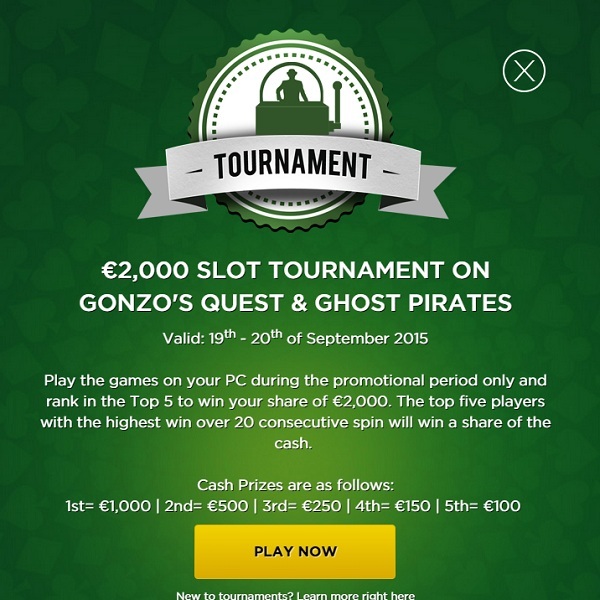 This Saturday Mr Green Casino is giving its members the chance to win a share of €2,000 in a special slots tournament on Gonzo’s Quest and Ghost Pirates. All you have to do is play the games from your PC on Saturday and Sunday and if you rank in the top five then you will win a share of the prize pool. The top five players with the highest win over 20 consecutive spins will win a share of the cash. First prize is a massive €1,000, second prize is €500, third prize is €250, fourth prize is €150 and fifth prize is €100. Both these games are great fun and offer loads of winning opportunities of their own so be sure to head over the Mr Green this weekend and see if you can win a share of this fantastic prize.